New York leaders are right to be upset that only seven black kids got into one of the most prestigious public schools in the city, Stuyvesant High, out of 895 spots. Something indeed ought to be done. 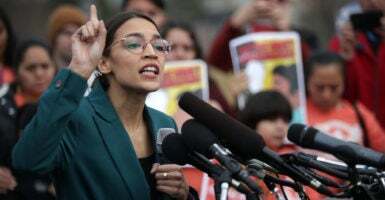 Unfortunately, officials such as Mayor Bill de Blasio and Rep. Alexandria Ocasio-Cortez, D-N.Y., emphasize equality of outcome rather than deal with the root causes of the problem. So, they are unlikely to fix anything but instead will make the problem worse. Test results have been equally dispiriting across New York City’s seven other selective schools, from Bronx Science to Brooklyn Latin. They show a persistent achievement gap in education across racial and ethnic lines. The only way to gain admission to these schools is to do well in the Specialized High School Admissions Test (SHSAT), a rigorous test of student aptitude in math and English. The charts below, provided by email by the New York City Department of Education, show the breakdown of eighth-graders who took the SHSAT this year and last, and those who got a first-round offer, broken down by racial and ethnic category. One immediate observation—and something that needs to be repeated again and again—is that these categories are in many ways worthless. “Asian” and “Latino” are panethnic umbrella groups that comprise countries of origin as varied as China, Korea, Cuba, Laos, Argentina, Mexico, and India—that is, places whose descendants in America have very different outcomes. The city’s Education Department does not seem to have such a breakdown. Having said that, what jumps out is that “Asian” eighth-graders take the SHSAT in disproportionate numbers. 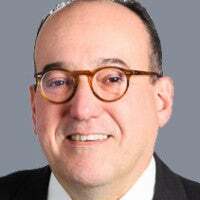 They represent 15 percent of the New York City public school system population, according to the city’s numbers, and yet were 31 percent of the test-takers. Non-Hispanic white kids came next, 18 percent versus 15 percent of the population. The numbers of “Latino” and black test-takers were smaller than their overall numbers. Around 24 percent of test-takers were “Latino,” around 15 percentage points lower than their overall number in public schools, whereas 20 percent of test-takers were black, six percentage points lower than their overall number. From these city government numbers, we can extrapolate that the overwhelming majority, or 60 percent, of Hispanics were Puerto Rican or Dominican, another 23 percent Central American, and 14 percent Mexican, adding up to 95 percent. The other 5 percent “others” includes Cuban-Americans, Spaniards, and South Americans. According to the Statistical Atlas, Chinese-Americans make up 48 percent of the city’s Asian population, far ahead of Indian-Americans at 19 percent and Korean-Americans at almost 8 percent. In other words, roughly three-quarters of this population is comprised of three groups with high cultural indicators. There we see that 29 percent of the “Asian” kids who took the test got into the selective schools, as did 27 percent of whites; but for “Latinos,” it was 4.8 percent and for blacks, 3.5 percent. That’s a proxy for who did well on the test. 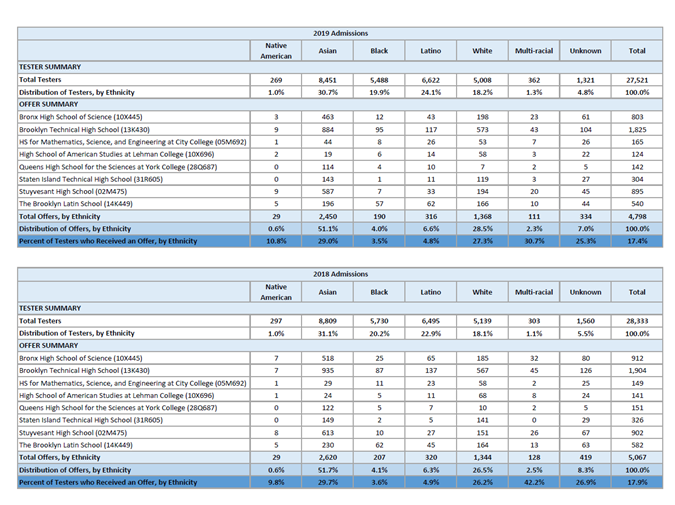 Progressives want to emphasize the line above on the chart, called the distribution of offers, which shows that more than half of the incoming class at the eight selective schools will be “Asian” and almost 29 percent white, while “Hispanics” will be 6.6 percent and black students 4 percent. As for de Blasio, he tried last year to scrap the SHSAT altogether, a proposal that went nowhere as other prominent New York leaders, including Gov. Andrew Cuomo, a liberal Democrat, distanced themselves from such a Stalinist approach. That would accomplish only one thing, however—destroy the specialized school system that is not just the only bright spot in the city’s otherwise bleak school system, but one of the best in the country. It would do nothing to bring up the Latino and black kids. The question then remains, how do we help these students? We help them by really addressing what is holding them down, and sharing best practices. What makes people succeed? Well, many things: grit, perseverance, hard work, putting a premium on education, keeping families intact. Reams of studies show that students with a mom and dad at home do best. 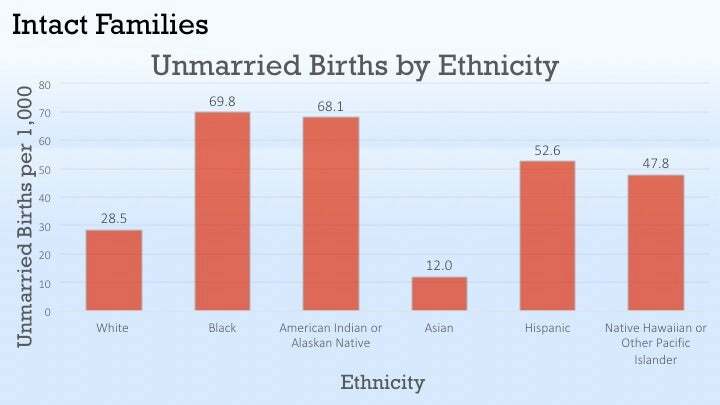 Those with the lowest out-of-wedlock birth rates, according to the Centers for Disease Control and Prevention, are Asian-Americans. 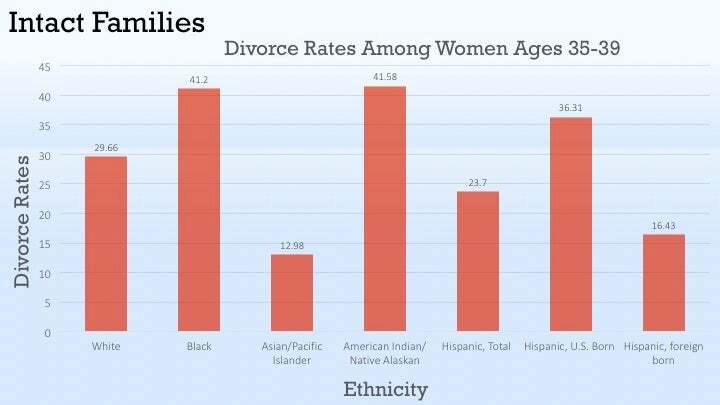 Asian-Americans also have by far the lowest divorce rate, according to the Department of Health and Human Services. 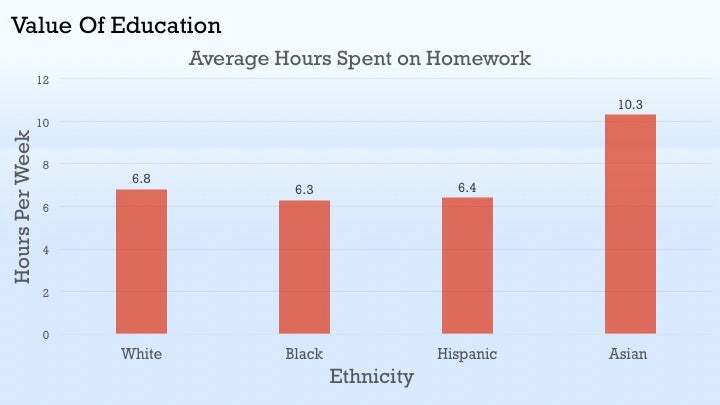 And unsurprisingly, according to the National Center for Education Statistics, Asian-American kids spend a lot more time doing homework than students in other categories. None of this is to say that addressing these issues will be easy. They have abandoned their responsibilities, acting like boys instead of men. We know the statistics—that children who grow up without a father are five times more likely to live in poverty and commit crime; nine times more likely to drop out of schools; and 20 times more likely to end up in prison. They are more likely to have behavioral problems, or run away from home or become teenage parents themselves. And the foundations of our community are weaker because of it. Obama paid a price for his bluntness, and was criticized by those who insist that failing grades are due to “institutionalized oppression.” But leadership requires courage. And de Blasio, Ocasio-Cortez, and the others ought to support charter schools and other forms of school choice. Studies such as a recent one by Stanford University show strong “learning gains” by students in New York City charter schools compared with their peers in traditional public schools. Regrettably, the mayor has waged an ideological crusade against charter schools, as our friends at the Manhattan Institute demonstrated in a report last year. Under his administration, the number of approvals for space requests for these popular schools has plummeted by 60 percent. Progressive politicians such as de Blasio and Ocasio-Cortez are the ones making the biggest noise about economic inequality and its racial component, yet are unable to do anything about what causes these problems. Education is the all-important rung in the ladder of success in America. So long as the achievement gap persists, don’t expect inequality to go away.